Derek Blauch is one of only two employees who can say he has worked for all three Vista entities – The Vista Foundation, The Vista School, and Vista Adult Services – during his tenure. Currently serving as the Community Integration Supervisor within the Employment Services Department, Derek previously held the roles of Behavior Technician, Educational Behavior Support, and Personal Care Assistant across his last seven years with Vista. Referred by his sister, Ashley Blauch, a Middle School Special Education Teacher at Vista, Derek came to Vista with a bachelor’s degree in psychology from Messiah College and initially never envisioned himself working in the fields of education or human services. 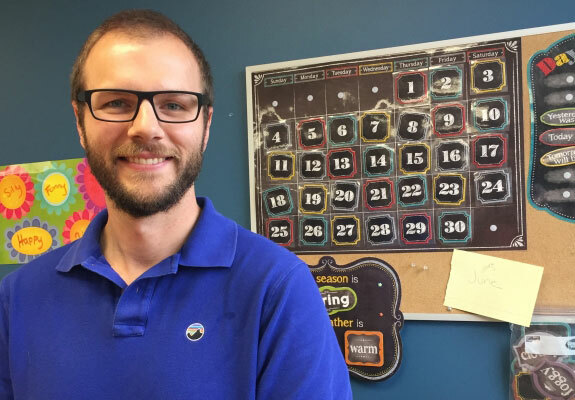 After filling direct care roles with at-risk children and youth, Derek found himself wanting to land somewhere that he could be a stronger contributor to the programming, with a focus on Applied Behavior Analysis. He had come to the right place. What is something people might not know about your position? What sparked your interest in working for Adult Services? What have you enjoyed most about being a supervisor? With the recent revitalization and implementation of Vista’s induction program, Derek, as a Certified Safe and Positive Approaches and Medication Administration Trainer, is serving as a teacher to incoming hires who are eager to get started with the organization.